As a professional sign company, we are always searching for additional ways to give our customers an enjoyable and successful sign buying experience. We’d like for the process of getting one (or more) sign to be as easy on you as possible. Therefore, our service offerings include all the steps required to give you a great sign. Why work with a Sign Company? Working with a group of professionals is more efficient and effective than working with each specialist individual. The team aspect greatly increases the value you receive and reduces the burden on you in coordinating the project. No two signage situations are perfectly alike. We work with you to fully understand your signage needs and situation before giving you an estimate on designs and/or producing your signage. We help you turn your concepts into reality. With our years of experience in the industry, we understand what will work best for the signage you need. Everything from colors to logos to materials, we help you design the best sign for your project. Depending on the type of sign and its final location, you may need to secure city and/or county sign permits. Those permits may limit what kind of sign you can have and various aspects of your signage. Part of our pre-production phase is to work with you to determine what local rules and regulations there are and design your signage around those parameters. 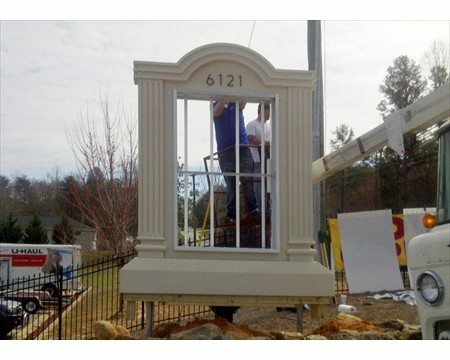 Once complete, we can work with you to install your signage. We have years of experience and qualifications to get the job done right. Over time, your signs will need maintenance and repair, particular if you have outdoor signage. We offer services to periodically perform needed maintenance and/or repairs on your signage. 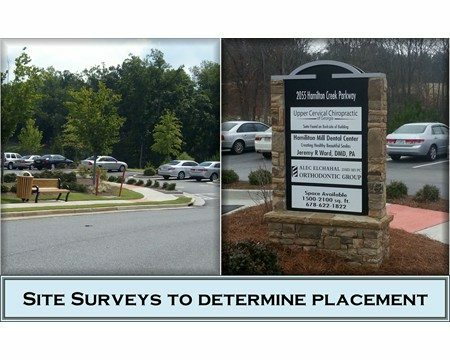 As your business grows, you may find that you need additional signage – new locations, more work vehicles, etc. When that happens, you want a sign company you can rely on. We pride ourselves on building long-term relationships with our customers. Often, our customers will return to us with additional signage projects. Stuart Pro Air, a division of Stuart Mechanical Services, is one of those customers. Here is how we were able to work with him on an on-going basis to provide him with all of his signage needs. 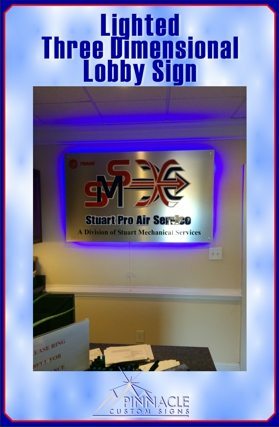 In early December, Antonio Galvan from Stuart Pro Air, a division of Stuart Mechanical Services, in Buford Georgia approached us about producing some various types of signage for him; most of which is somewhat unusual for his industry. 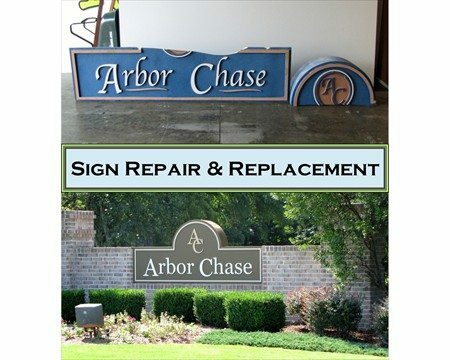 Being a full-service company allows us to produce some things that don’t fall into the realm of your “typical sign”, and allows us to go that extra mile for our customers. In the past, we have done several things for them such as vehicle graphics (both wraps and lettering) and floor graphics that recognize their employee of the month. However, he was interested in doing some more creative things in December. He first asked that we create stickers with their logo and website so he could attach them to travel coffee mugs for his employees. Following this, we did several designs for graphics to cover some corn hole boards. We eventually covered seven sets of them with vinyl with a variety of designs, ranging from sports themes to a set with their logo. We then also created a lighted three-dimensional lobby sign that really stands out on the wall and creates quite an impression on their customers when they walk in the front door. We made this using routed red and blue acrylic in the shape of their logo. The acrylic was then mounted on a white PVC backer to look like an outline of the logo. We then mounted this on a sheet of brushed aluminum poly-metal (sometimes also called di-bond). Cut vinyl lettering was added that identified the parent company and included the Trane air conditioners logo, for which Stuart is an authorized retailer. Finally, we added blue LED lights to the back of the poly-metal and mounted the entire sign to the wall using stand-offs. The lights create a nice glow that also helps let the sign stand out against the light-colored wall. Next, he asked for full-color table covers that can be used for home show booths and other such trade shows. We designed the table cover with the same layout as the logo for the lobby sign, on a black background to really make it “pop”. We anticipate wrapping a third van in their fleet in the next few months, using the same design we developed for them earlier this year. We are also looking forward to adding window graphics on the back window of a pickup truck they also use. While some of these were not our typical projects, and others were, they all allow Stuart Pro Air and Stuart Mechanical Services to promote a consistent brand in the office, on the road, with their employees, and at special events. Being a full-service sign company, allows us to use our creativity and our customer’s brand to come up with some truly unique signage.